Josh is away up north for the next few days, and I am hanging out with my kiddies and making the most of a chance to catch up with friends. But missing my man! I sent some of these with him to do his practice presentation run at my mums last night, and they were very well received. Although I have my Kenwood kitchen mixer, its nice to have recipe where you don't cream anything, you just whisk, and stir. Very refreshing! This is a Bakerella recipe, oh man, I love this woman. She is SO dam clever. I should admit... I sorta forgot to get a picture of the finished product. Noob mistake, I know, I got pictures leading up to it... And now, they are all gone!! Cos they were pretty dam good. I went for a super cute scalloped look for my oreos. And they were super cute. They stretched out a wee bit once cooked. CUUUUUTE! Although these were awesome, they were a bit of work. And the thing is, I didn't feel like they really tasted quite like Oreo's... at all... I can't put my finger on it, but I couldn't seem to get the cookies hard enough, crunchy enough... 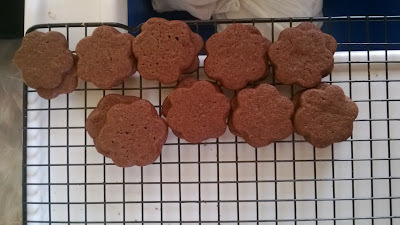 Especially once iced, and after a few hours of sitting, the icing soaked in a little and made them more soft. DO NOT CONFUSE THIS.. these were good, just not good oreo's. 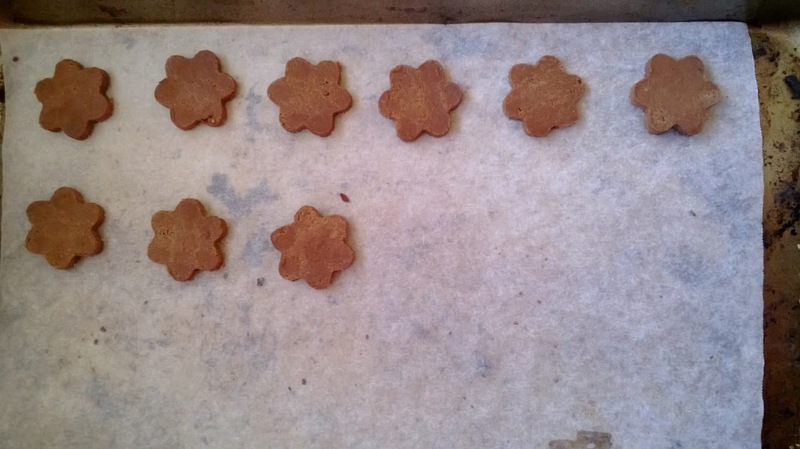 Good cookies. Check out Bakerella for some much more adorable photos than I can provide, or remember to take. These reminded me of my dads chocolate slice, which is way faster to make, like WAY faster, but these are worth a go. Let me know if you have better luck with the crunchy factor. 228 g unsalted butter, melted and slightly cooled. In a medium bowl, whisk together the butter and sugar until well combined. Whisk in the vanilla and chocolate. Whisk in the egg until combined. In another bowl, whisk flour, cocoa, salt and baking soda until combined. Stir flour mixture into the chocolate mixture. Mix well, using your hands to combine if wanted. Let the dough sit for an hour to firm up. Transfer the dough to a sheet of wax paper. Shape into a log about 2 1/2 inches in diameter. Place log along the edge of wax paper. Shape as you roll to maintain a smooth cylinder (it's a little harder than you would think :S). Twist ends of paper to secure and help keep the shape compact. Refrigerate for at least 2 hours, I did mine overnight. If log begins to settle on one side, turn slightly every 15 minutes until hardened more, so as to not end up with a flat side. Preheat oven to 160C (325F) and line baking sheet with parchment paper. Place on prepared baking sheet and bake for around 20 minutes, or until cookies are firm to the touch. 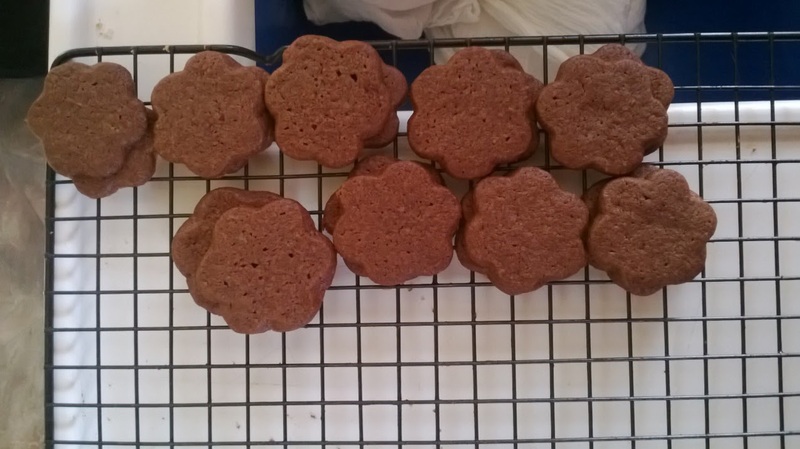 It's really hard to tell when they are done, because they are so naturally dark. We'd really appreciate it if you could register or alternatively I can personally update our files for you, if you could let us know your facebook, twitter, pinterest,and /or instagram addresses if you have them, as well as contact details and traffic numbers to your blog each month. Alternatively you can just email me back the info.